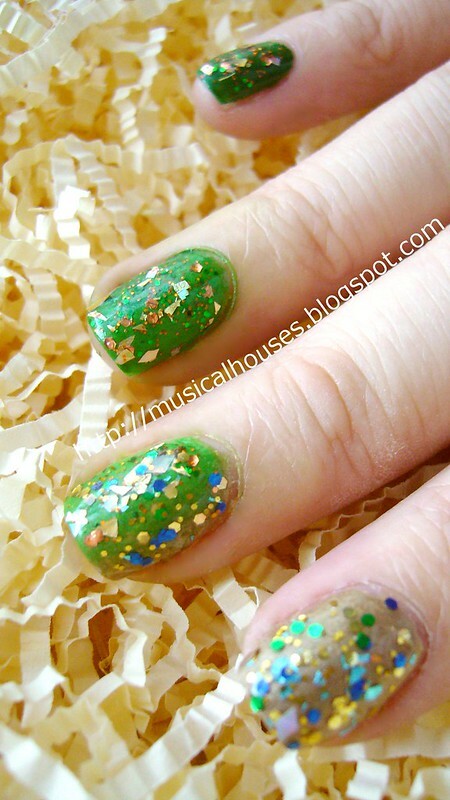 Remember my failed St Patrick's Day gradient nail art the other day? Since I wasn't totally happy it, I decided to fix it up the way most of us nailphiles do - add on a layer of glitter! Aaaannnd, I think it just got better! Glitter FTW! I added two glitter polishes, Dancing Queen and Disco Inferno, from Nails Inc. I really love these glitter polishes, they are super cool, and give any mani the "indie glitter" look. 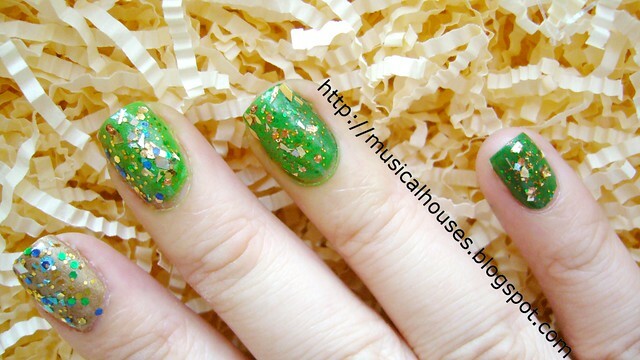 I layered Dancing Queen over the gold parts of the manicure, and Disco Inferno over the green parts, and tried to blend out the two glitters together so it wouldn't look like a sudden change in glitter colour. I liked this much better than the previous manicure, because I feel like my horrible gradient is less obvious with the glitter on top. And of course, it's got glitter! Glitter does a mani good. It really does! So that's it for my St Patrick's Day manciure - nothing terribly inspired, I'm afraid, but hey, it's better than nothing!